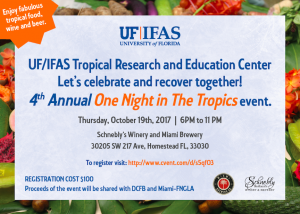 The University of Florida-Tropical Research and Education Center (TREC)’s 4th One Night in the Tropics event is under way. This year’s celebration is a special one as our community has suffered major losses due to Hurricane Irma. After several meetings with agricultural industry leaders, it was determined that we will move forward with the event. Most of all, this community will recover and celebrate together our vibrant industry. TREC decided to split the proceeds of this event with Dade County Farm Bureau and Miami-Dade Chapter of Florida Nursery Growers and Landscaping Association. This way they can assist growers who are in need from Hurricane Irma. We reiterate our commitment to the growers and to the future by continuing to provide excellent research and teaching, in addition to extension services to the community. New faculty are now on board, and established faculty have received international, national and state awards for the work they have been doing to assist the 2nd largest agricultural industry in the State on Florida. We continue to thrive for excellence and to give back to the community. The 4th One Night in the Tropics will feature once again, fabulous food and local drinks at Schnebly’s Winery and Brewery. You will enjoy a menu of delicacies that represent our industry. As usual, we will have a silent auction featuring many unique landscape plants, artwork, gator gear and many other items donated by our supporters. We look forward to seeing you. If you need to reach me, my number is 786-217-9226. You can register online by clicking the link below.